This Islam In Bible Prophecy study concludes this series of lessons, by showing how the Jesuits cause people to point to Islam as the antichrist beast, in order to deflect blame away from them. As you have seen in these studies, the Roman Catholic Church and Jesuits have used the Muslims as their army, and they have blinded them about the pure Gospel of Christ. They cause false prophecy teachers to point to Islam as the antichrist beast, in order to deflect blame away from the Jesuits, who are using the Roman Catholic Church, and Islam, to push the world into their New World Order. The prophecies of Daniel, Paul in 2 Thessalonians 2, and John in Revelation, all declare that Rome is the last beast of prophecy. It has changed forms over the years, but it is the kingdom that was in power during Jesus ministry, and it is the kingdom that will be destroyed by Jesus when He returns. Satan reigned in the pagan Roman Empire, where he was worshiped through all of their false Gods. He used them to try to destroy the Early Church of Christ, killing millions. Our Lord caused the Roman Empire to collapse, which made Satan lose his power. Satan countered by empowering the Roman Catholic Church to rise up in its place. He used them to burn Bibles and to kill over 50 million followers of Christ. Our Lord caused the Roman Catholic Church to lose power through the Protestant Reformation, and then when the Pope was taken prisoner in 1798 A.D.
Satan countered by empowering the Jesuits to take control of the Catholic Church. They’re creating a New World Order, where he will be worshiped, and the saints attacked. Our Lord will cause the Harlot Church to be burned and desolated, and He will destroy the scarlet beast of the Jesuits. The Muslim army, Al Qaeda and ISIS, all play a role in the end times; as they are the clay mixed with the iron of the Jesuits of Rome, which war against Jesus and His Church. But the Jesuits of Rome control Muslims countries and militant rebels, as All Roads Lead To Rome. The Jesuits want you to believe that Islam is the antichrist beast and that a one-man leader will rise up out of Islam, the Mahdi. They have positioned people inside Christian Churches to point to Islam and Muslims as the antichrist beast. 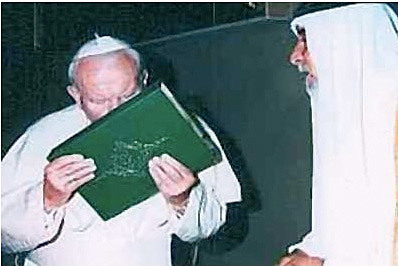 People such as Walid Shoebat, Lieutenant General William “Jerry” Boykin (who is a Catholic Knight of Malta), Kamal Saleem, and others; go to churches to point to Islam and the Muslims as the enemy. Click here to read a review of Walid Shoebat, which exposes his story of being an ex-terrorist as fraudulent. This helps keep the focus on the Muslims, instead of realizing who the real enemy is. So don’t be deceived by false prophecy teachers who say that Islam and the Mahdi are the antichrist beast, because Revelation 13 and 17 only point to one people group, the False Prophet Jesuits who control the Antichrist Beast Roman Catholic Church. The Catholic Church has historically controlled the Muslims and used them to kill Jews and Christians, and to help take control of countries. Click here to read a study that shows how the Roman Catholic Church and the Jesuits fulfill Bible prophecy.